*Updated 3 Feb 2019. Newsflash! 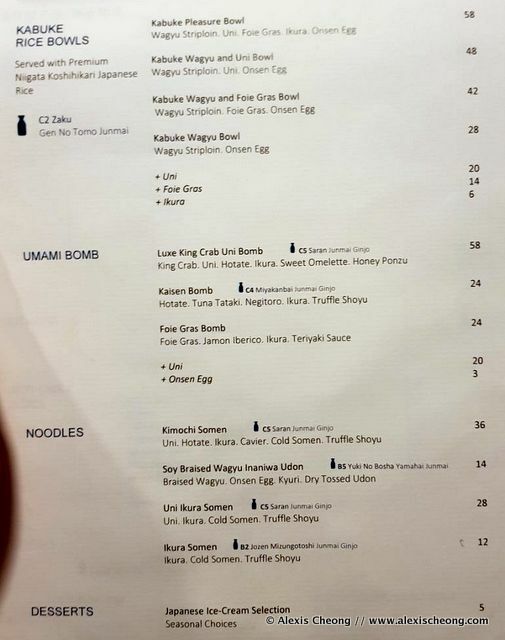 My friends just opened a new Japanese sake bar called Kabuke on Telok Ayer above My Awesome Cafe and if you guys are interested in sake, do pop by! They were inspired by their experiences in authentic little sake bars in Japan and decided to bring that here to our shores. It's a cosy little shophouse with a gigantic hand-drawn fan to divide the bar and sitting area (sits about 12-15) and a private space. If you Googled "kabuke" and saw something else from Urban Dictionary and not this blog post, kindly ignore it *erhem*. The founders wanted a unique name that combines "kabuki" which is classical Japanese dance-drama and "sake". 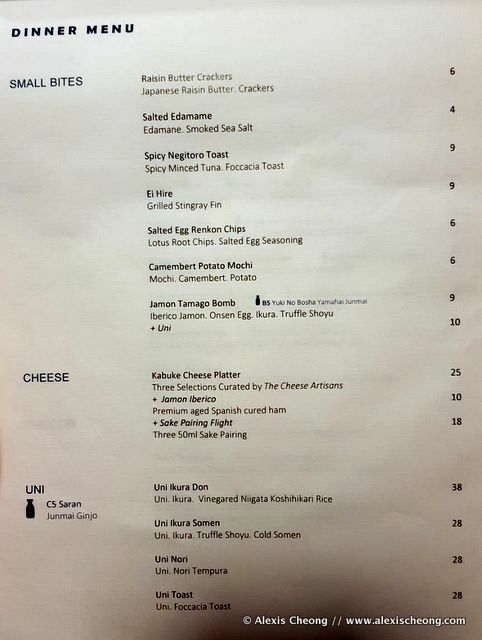 Here's the opening menu for their sake selection during this period. It will change every three months so you can get to try many in time to come! 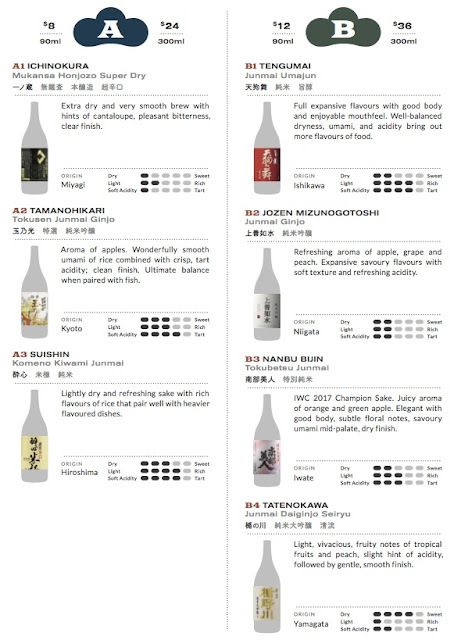 Prices start from $24 for a glass or 3 for $24 for a sake flight (a trio of 3)! 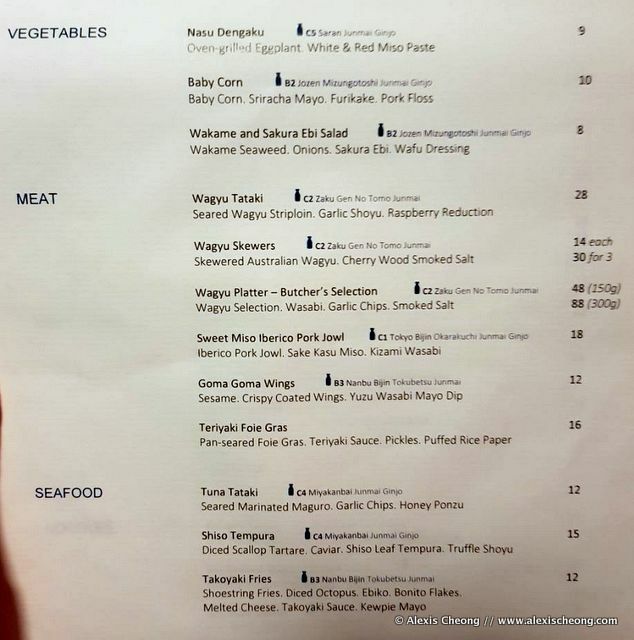 Here's the food menu as of 2019. My favourites are the Goma Goma Chicken Wings and Takoyaki Fries (making waves on Instagram already), along with the Beef Bowl. There are also seasonal items of the day/week which is not on the menu. OK they were as a drunk Japanese would say, "dericious". Absolutely addictive as well. The baby corn with chicken floss is considered a Vegetable, and I love it. What a brilliant idea for a simple yet textured dish. And then these babies are all NOT ON THE MENU! The momotaro tomato was heavenly with bits of iberico ham. The tempura prawns were wrapped in Vietnamese spring roll skin on top of some sesame dressing. Again I like the slight twist to the classic. This miso pork belly with yuzu-infused veggies on top is the BOMB. The pork was almost crunchy at the fatty part in the most satisfying sort of way. And some Hokkaido ice cream/sherbet which made me want to go to Hokkaido even more. Ok all these were eaten on at least 3 different occasions where I popped down for a bit of sake. And I find it very surprising that the food does hold its own and were tailored made to be paired with sake! We also had the Kabuke Flight (3 x 50ml for $24) which consisted of the Ichinokura Mukansa Honjozo Super Dry, Nanbu Bijin Tokubetsu Junmai and Dassai Junmai Daiginjo 50 (previous soft launch menu combination). The sakes were really delicious in their chilled state in the sake glasses. The crowd pleaser and obvious favourite would be the Nanbu Bijin (literally the Southern Beauty in Mandarin) which we heard was award-winning. 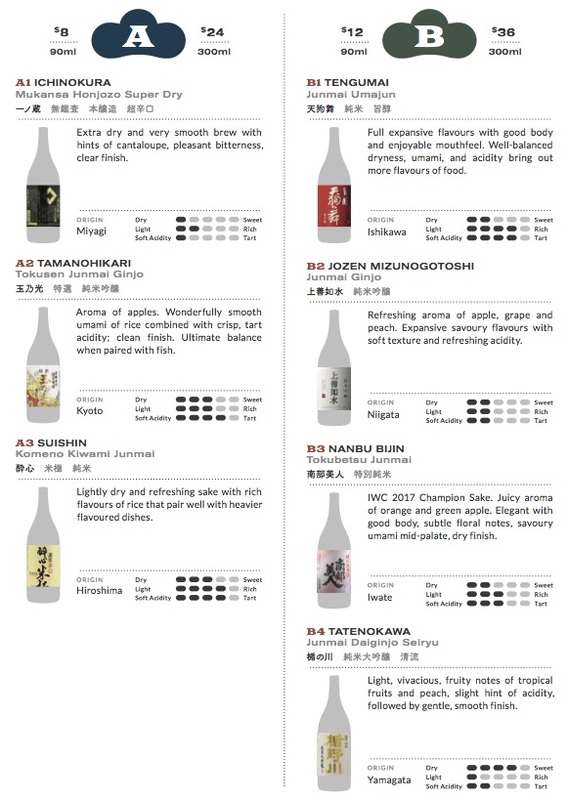 Looking at their website, they are already the 5th generation of sake makers! I really like the decor of the place for how interesting and authentic it is with the red lantern concept above the bar. There's also food available which I have yet to try - will update the post when I do! 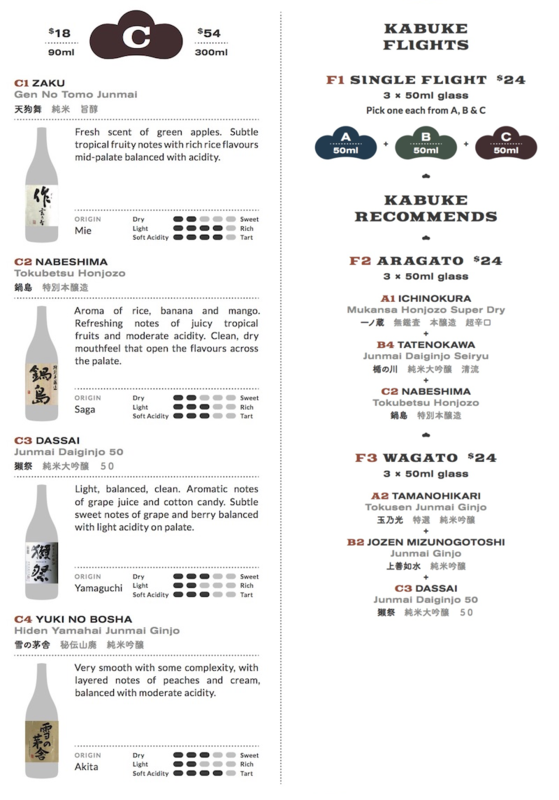 For now, all I can recommend is for sake lovers to head down to Kabuke for a night of secret sake.